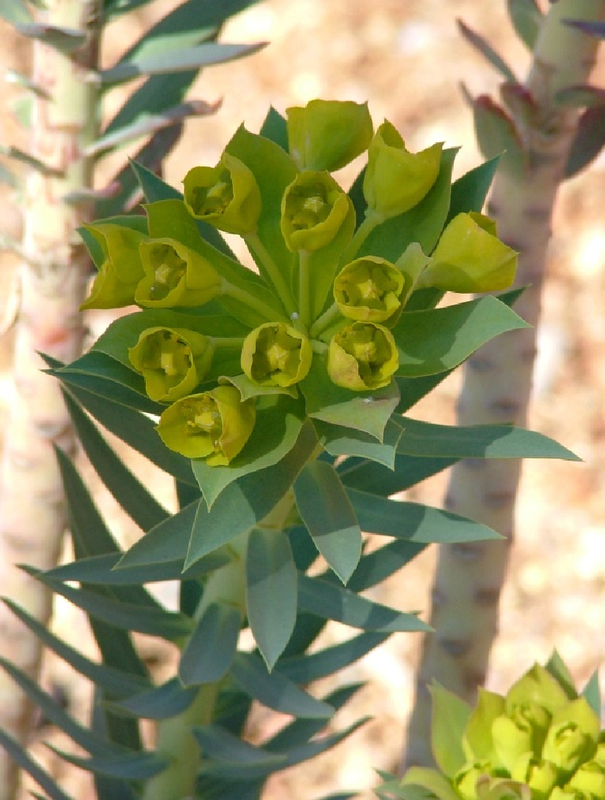 A member of the Euphorbiaceae or spurge family, myrtle spurge is related to the notoriously invasive leafy spurge. It is a creeping perennial that grows anywhere from 8-12 inches. A very waxy cuticle layer in the leaves and stems give it a distinct blue-grey appearance. Leaves are densely arranged in an alternate pattern along the stem. 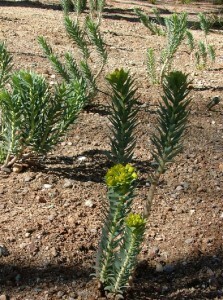 The showy, yellow flowers appear in spring and occur in clusters at the end of the stem. Reproduction is thought to be mainly caused by seed spread, but may spread from fragmented roots caused by disturbance. Like most spurges, it contains a milky sap that is an irritant. 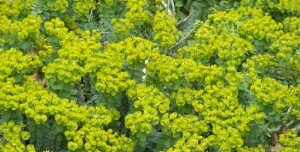 Myrtle spurge infestations are often attributed to escaped ornamental plantings. 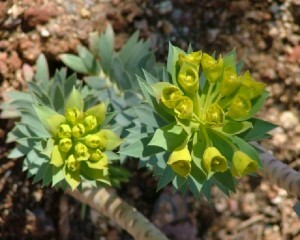 This plant has been seen invading prairies in Colorado, Nevada, and Arizona. 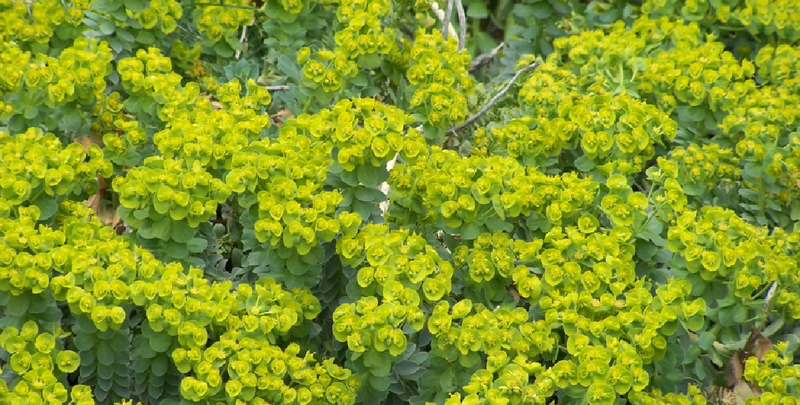 Myrtle spurge is a concern in Teton County due to its aggressiveness in escaping ornamental plantings. 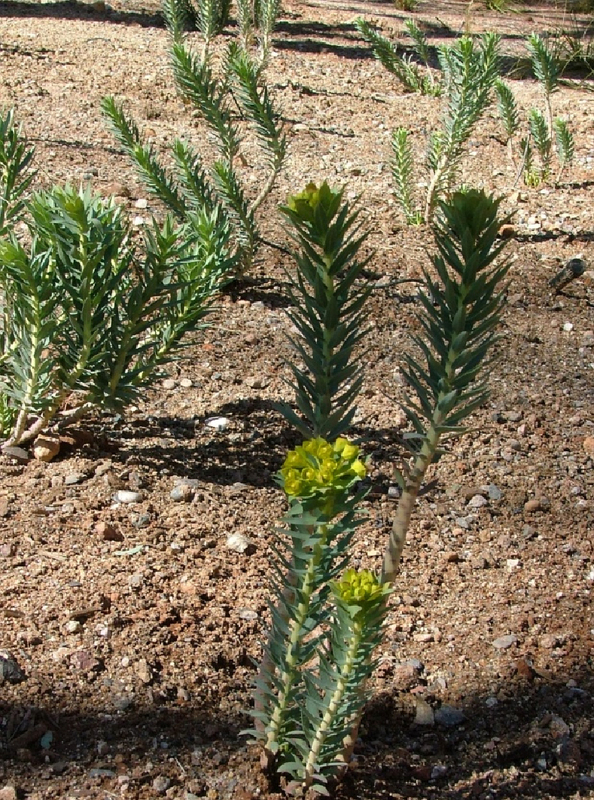 This plant was cultivated as an ornamental in dry, rocky soils; it has since come to spread via exploding seed capsules to open native systems, crowding out native vegetation. It is speculated that its acrid sap and low nutritional value make it a deer-resistant species, which in turn is why it is favorable for ornamental gardens in some regions.